Axle Creek will release their full-length album, The Journey Home on January 27, 2015. The music feels like classic rock, but we often blend multiple genres — most notably on the slower songs there is a strong country vibe. 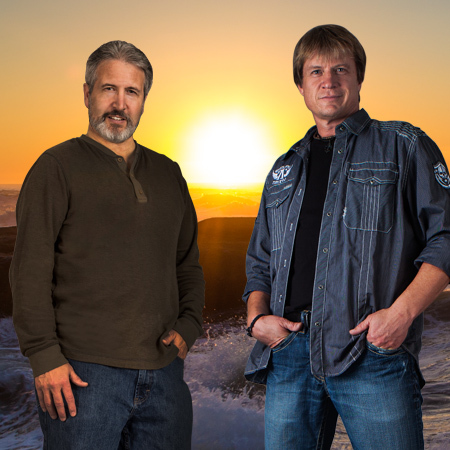 Axle Creek is comprised of the singer songwriter duo of Randy Porter and Bob Carey. Randy grew up working his uncle’s farm and credits his vocal coach, an 8 track tape of Olivia Newton-John, and his private vocal studio, a closed cab John Deere 4430 tractor, for developing and perfecting his unique sound. Since then Randy has been featured on hundreds of national and local commercials and live performances. Some national spots you may recall are ABC’s, “Friday Night TGIF” and Disney’s “On Disney”. Randy has toured with various Department of Defense and USO Tours around the world. Randy currently works as a consultant for a high-tech learning firm in Utah but takes every opportunity to exercise his vocal chord…even if it’s singing in the family room with his wife and daughters. Being with his family is his all time favorite kind of singing and performing. Bob grew up in Oregon, loving the ocean and the deep green of the forest. He’s been writing songs since he was 14, working out chord progressions on an old Ovation 12 string guitar. With new and old friends, he created “The Journey Home” – ten of his favorite songs he had written – crossing into modern classic rock, and Country set for release in January of next year. He is involved in marketing, advertising, and public relations from top to bottom, connecting brands to customers. He cares for his wife who is fighting Multiple Sclerosis (MS), Diabetes, and Osteoporosis and has two sons who are moving forward in their careers.